THE THING about “Days of the Dead” Indianapolis! The inimitable “Russ Wrangler” arrived at my place around 1pm; all smiles and full of energy. Clad in sunglasses and sandals, he looked more prepared for a day at the beach as opposed to a horror convention but clearly the overall message was “vacation” and a welcomed one at that. We loaded my things and immediately embarked for Indianapolis with no lulls in conversation, making the drive go by much quicker. This was my third Days of the Dead in Indianapolis (fourth overall) and Russ’ second. I remember attending the very first one while being impressed with how fan-friendly it was; something I’d hoped hadn’t changed. It seems like fan conventions of any kind start off slow and friendly and, should they find success, later become out-of-control Goliath’s with the fans getting lost somewhere in the mix. With July being such a busy month in terms of horror activities, I wasn’t sure if I was attending this event solo and for a single night (as I’d done their Chicago event last November covered HERE) or overnight with Russ since his attendance wasn’t certain. 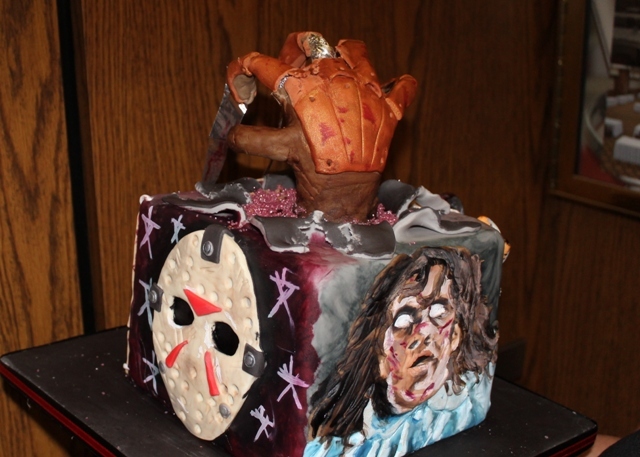 Having just celebrated his birthday on the Fourth of July, and with us already slated to attend the upcoming Fright Night Film Fest in Louisville, I completely understood. 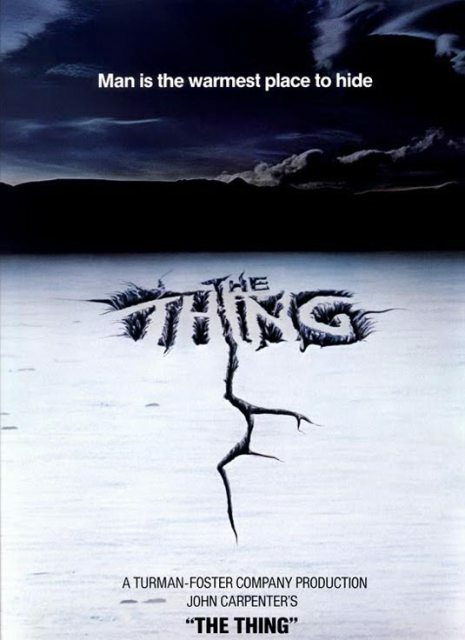 Ultimately, it would be our mutual love of John Carpenter’s The Thing that would become the deciding factor. That’s the funny thing about my fandom of John Carpenter…as much I love his iconic Halloween, I’m a far bigger fan of The Fog and The Thing. Though neither would prove as successful at the box office, to me they’re both damn near perfect movies and worth multiple viewings. 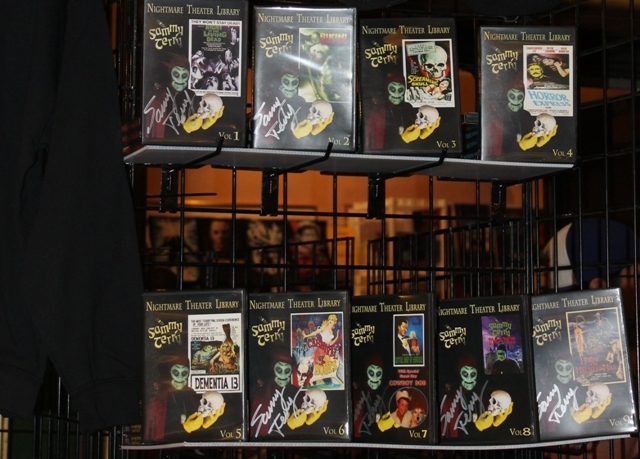 The 2013 Days of the Dead in Indianapolis would see the largest gathering of cast members from The Thing as well as a collection of memorabilia courtesy of John Hart (ALL of which to be covered with more detail soon). We arrived at the hotel just after the event started and quickly checked in. 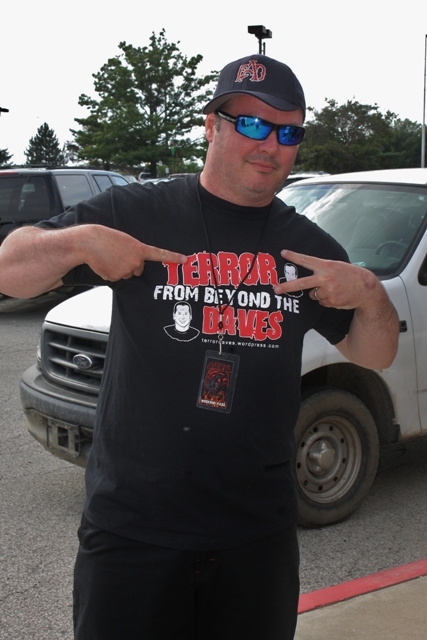 While putting down our bags, I handed Russ an extra Terror from Beyond Daves T-shirt which I’d meant as a joke but Russ honored me by actually wearing. This would give the impression that he was the other Dave and allow for more effective networking. Concerning event coverage, its always better when you’re a duo as opposed to a single. The ploy worked since several folks referred to him as “Dave” and a couple praised “our” site. Though “Russ” is every bit his real name as “Dave” is, this was an extremely nice thing for him to do. 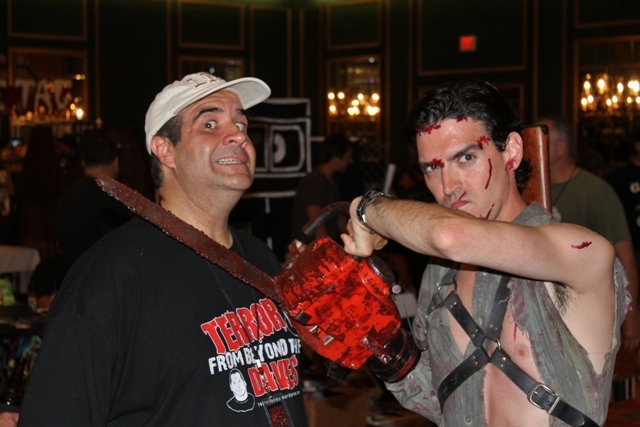 He’s not only worked the “Scares the Care” table at many horror events, he’s an extremely friendly and talented guy (which would become a theme this weekend), has a LOT of great friends (including actress, P.J. Soles), and can not only stand alone, but do so decisively taller than myself. It was likely more apt that I run around calling myself “Dave Wrangler” as opposed to him pretending to be a Dave but I both welcomed and appreciated his assistance. When it comes to ice-breaking with celebrities, keeping high/positive energy, as well as photography skills…there’s no doubt that he can be more effective than David Albaugh and I put together! 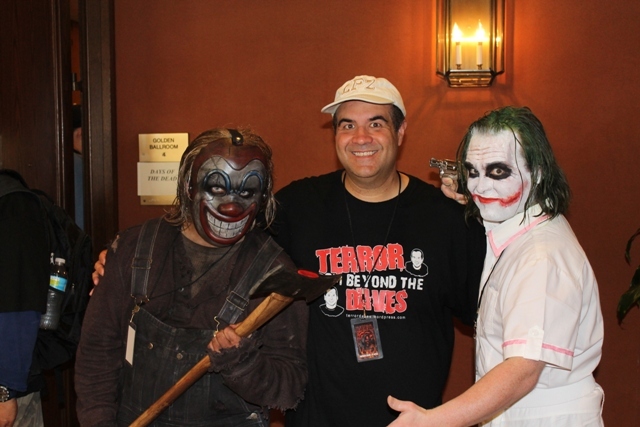 We’d no sooner walked into the main celebrity room when I bumped into the guys from Freakhouse Flicks…both were attending as civilians rather than clad in their PA host costumes. They’d just attended Indianapolis Horror Host, Sammy Terry’s, Wake the night before and were telling me all about it. Apparently the turn out for the classic host was immense. 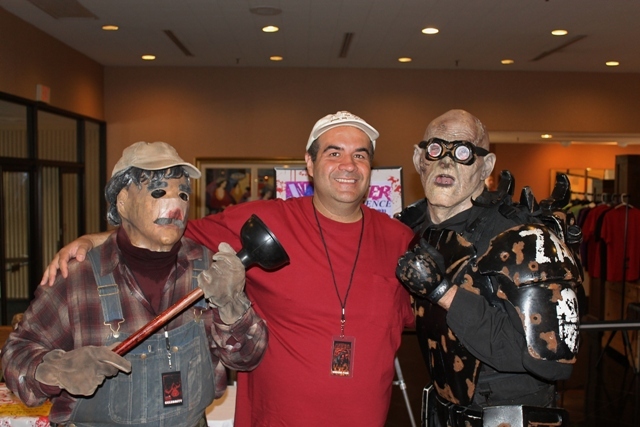 Sammy Terry is one of the longest running horror hosts and, with his son now firmly at the reigns, likely to remain a presence in Indianapolis for many years to come. 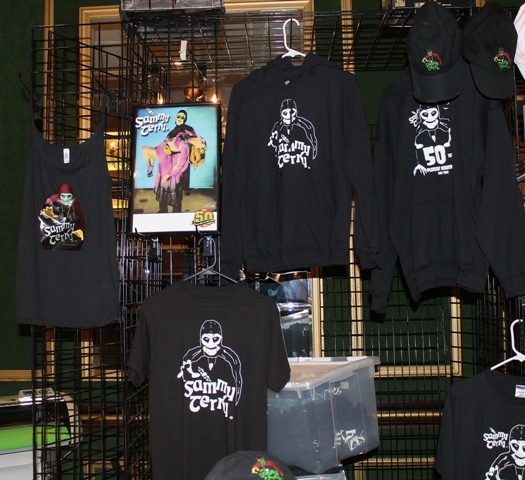 Obviously the current Sammy Terry was unable to show up at Days of the Dead but kept a presence none the less via a merchandise booth. Days of the Dead attracts a loyal following of fans who often dress in their signature costumes. Watch them hands now, Joker! Kitty Zombie (Right) is always worth saying Hello to! 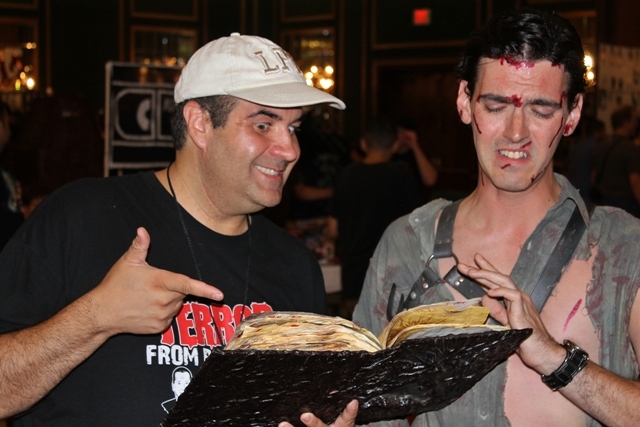 Adam King’s “Ash” wrote the book on entertaining guests! No convention complete without the stunning Sasha Mullins! There were some newer ones (at least for me) which I’ll be featuring in a separate post! The initial plan was to do a walk-through before meeting any celebrities. However, this all changed when we saw legendary rocker, Lita Ford, with hardly anyone waiting to see her. Russ and I both knew that Friday nights are always slower and that this was likely a rare opportunity for us. Not wasting a moment, we immediately went to see her. Barely 10 minutes into the event, or first celebrity encounter was under way…. This entry was posted in Alien Invasion Films!, Big 80's Horror!, Convention & Expos, Science Fiction and tagged A NIGHTMARE ON ELM STREET, ASH, DAYS OF THE DEAD, Freakhouse Flicks, Freddy Krueger, FRIDAY THE 13TH, FRIGHT NIGHT FILM FEST, HALLOWEEN, Jason Vorhees, John Carpenter, KITTY ZOMBIE, LInda Blair, Lita Ford, Sammy Terry, Sasha Mullins, THE EVIL DEAD, The Exorcist, The Fog, THE JOKER, THE THING. Bookmark the permalink. 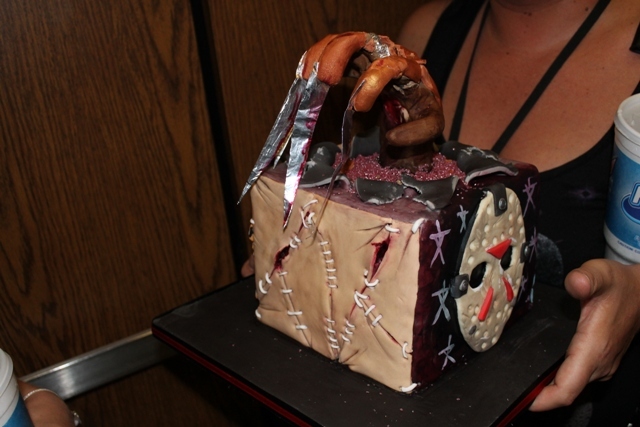 ← 4th of July Fireworks Herald a BUSY Horror Convention Season!